If you would like to use your national senior card abroad then we do have to kindly warn you that there is a big chance that it will not be recognised. 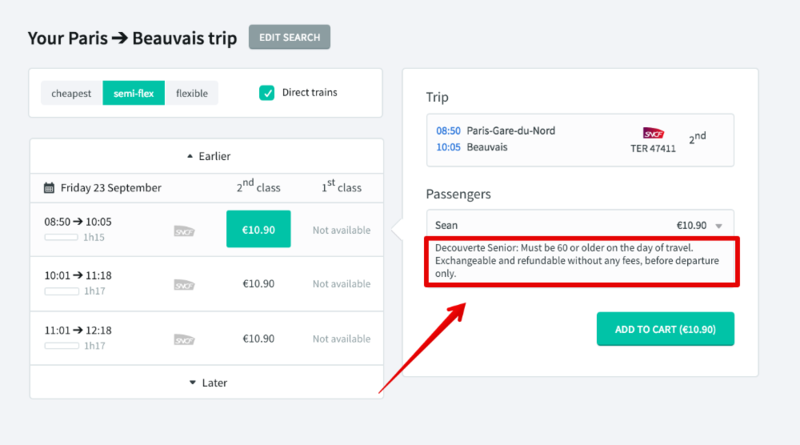 For instance, an Australian Seniors Card is not recognised as a valid discount card for train travel in France. Only a national French senior card could recognised as valid. However, you are still left with some options! Trainline automatically applies any age-related discounts and/or fare conditions when you are booking your tickets. All you need to do is enter your date of birth in your passenger profile and we will do the rest. The discounts or fare conditions will only be applied if they are available for your selected route and travel dates. If they have been applied, you will see this once you have added your tickets to your cart. Your second option is to purchase a Carte Senior+ for €60 per year if you would like to mainly travel within France and you are at least 60 years of age. The Carte Senior+ can give you up to 50% off full-fare Loisir tickets on TGV trains, daytime Intercité trains, and selected Intercité overnight trains. Plus you will always receive a guaranteed 25% discount in all other cases, for all trains—even last-minute purchases. At this point in time there are no age-related discounts or fare conditions for Deutsche Bahn trains. If you wish to obtain a senior discount, then you can purchase a BahnCard. This is a frequent traveller card which is also available for travellers over 60. You can find out more about the BahnCard and prices by clicking this link. Please be aware that this card is only applicable for domestic travel within Germany and for any route operated by Deutsche Bahn. 25% off through the Railplus discount on international journeys. The Carta d'Argento can can be purchased from a ticket office at a station ticket office or from Trenitalia’s website. Please click here for more information on how to purchase this card. How do I use these cards on Trainline? If you have purchased a rail card that you would like to use for your booking, please read our article on how to add your card before you book.